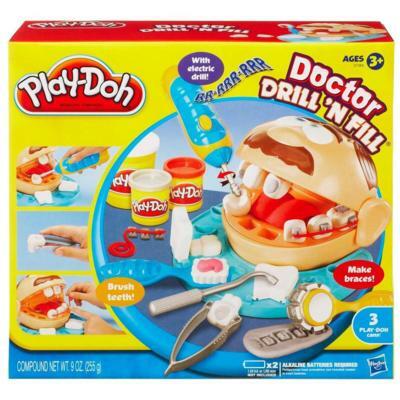 Make going to the dentist a little less scary with the DOCTOR DRILL ’N FILL playset! Your child can make braces and brush teeth for the included head with ears! The playset comes with fun tools for all kinds of dental play and three cans of PLAY-DOH modeling compound. Play base comes with head with ears, electric drill, tweezers, dentist tool, mirror or braces roller, toothbrush presser, instructions and 1 five-ounce and 2 two-ounce cans of PLAY-DOH Brand Modeling Compound.